It started with a $10 palm reading, but within a few weeks, she lost $75,000 to a smooth-talking hustler, a woman from Wellington, New Zealand, says. "They are so determined. They brainwash you completely. You are in their hands," the woman, who does not want to be named, has warned. The woman said she went to the witchdoctor and his wife for a palm reading after being handed a pamphlet at a street market. 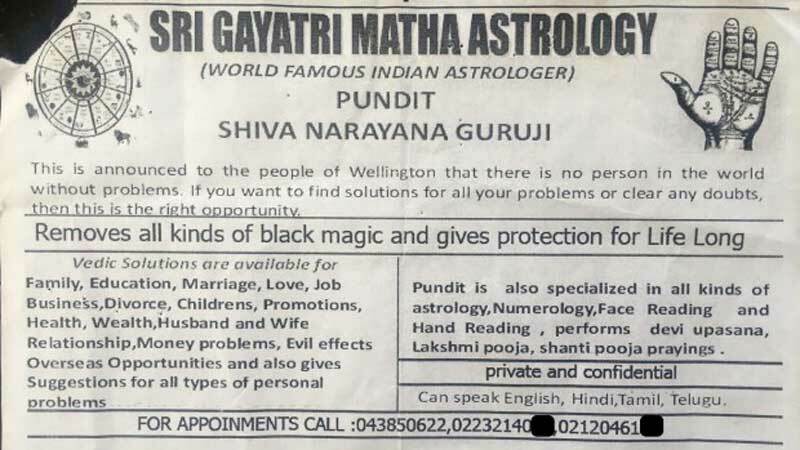 She said the male witchdoctor was of South Indian origin, with a moustache and medium-length hair. He dressed inconspicuously when outside but wore yellow robes during ceremonies. "They do wear priest's clothes in their house so you think they're good people." They used incense, coconuts and flowers during ceremonies, and chanted "aum Kali, aum Kali," to the deity of the same name. The couple forged a relationship with the woman, persuading her only they could rid her of evil spirits. She said she was told one of her own children was in danger. Soon the couple visited her house in suburban Wellington. The man noticed a dead bird outside, and said this was proof her house had a malevolent spirit. Soon, the woman was too scared to be home alone, so the witchdoctor's wife came to stay with her. "I was scared. I could not come into my house. They said 'there's a spirit in your house'." The witchdoctors made increasingly dramatic predictions, spoke of sacrifices, then told her she had only a week to live. Tormented and scared, she succumbed to demands, went to the bank, and handed over $25,000 cash. She also handed over cash and jewellery worth another $50,000 later in 2013. The witchdoctors left the country, but kept calling her. On Monday, a man who answered one of the phone numbers said he had been to New Zealand, but only in 2008. 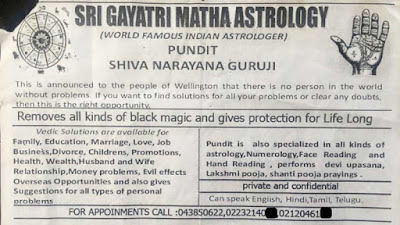 He said he did the shami pooja ritual, astrology and horoscope reading but not other practices of the kind advertised. "There are some good people ... there are some bad people," he said when allegations of wrongdoing were put to him. His service didn't offer refunds, but he urged the complainant to come to Bangalore. The woman said she no longer believed in black magic but was angry at herself for losing so much money and wanted others to avoid the same fate. "They do wear priest's clothes in their house so you think they're good people." Good lord. How does this woman walk and breathe at the same time?